Made from Potato starch (100% renewable and sustainable). 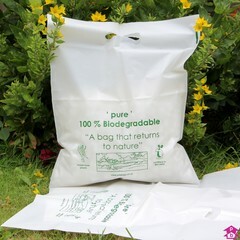 The bags completely disintegrate into carbon dioxide, water and biomass within 10-12 weeks in standard composting condition - leaving *no* harmful residue behind. Bags are certified "OK COMPOST" by EU standard EN 13432 & International standard ASTM D6400-99.